Pakistani official: "If there is any construction over there, I don't verify it"
ISLAMABAD, Pakistan (CNN) -- Pakistan's information minister denied accusations Wednesday that his country is expanding its capability to produce nuclear weapons. 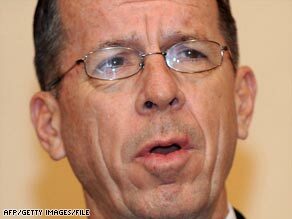 Adm. Mike Mullen told U.S. lawmakers last week that Pakistan was expanding its nuclear capabilities. This week, the Institute for Science and International Security published a report with satellite imagery that the group says shows expansion of "Pakistan's key military and civilian fuel cycle site near Dera Ghazi Khan." "If there is any construction over there, I don't verify it," Information Minister Qamar Zaman Kaira said of the allegations. "There may be some residential areas over there, and the old construction may be demolished, and the new construction should be there," Kaira added. "You can't say that the new installation is there." "Site preparations can be seen that will double the size of this compound," the institute wrote. "The reasons for this expansion are undoubtedly related to Pakistani decisions to upgrade its nuclear arsenal, currently estimated to contain roughly between 60 and 100 nuclear weapons." The Institute for Science and International Security, based in Washington, is a "non-profit, non-partisan institution dedicated to informing the public about science and policy issues affecting international security," according to its Web site. The group's focus is "on stopping the spread of nuclear weapons, bringing about greater transparency of nuclear activities worldwide and achieving deep reductions in nuclear arsenals," the site said. The report emerged more than a week after the chairman of the Joint Chiefs of Staff, Adm. Mike Mullen, the top American military commander, told U.S. lawmakers that Pakistan was expanding its nuclear weapons program. Pakistan recently secured pledges from international donors for billions of dollars worth of aid to bolster the government of President Asif Ali Zardari. On Tuesday, U.S. Secretary of State Hillary Clinton announced that Washington would rush an additional $110 million in humanitarian assistance to help the 1.9 million Pakistanis who have been forced to flee their homes as the military confronts Taliban militants in northwestern Pakistan. On Wednesday, Clinton assured senators that Pakistan's nuclear arsenal is secure and that U.S. aid money won't be diverted to produce even more nuclear weapons. Two American military cargo jets arrived at an airbase near the Pakistani capital Wednesday, carrying air-conditioned tents and pre-packaged meals for the refugees. The advance of the Taliban to within 60 miles of Islamabad last month sparked international fears that the government of the nuclear-armed country was in danger of collapsing. Pakistani government officials have repeatedly declared that the country's nuclear arsenal is secure from militants. But the institute report pointed out that fighters from an ethnic Balochi separatist movement have carried out a ground attack on the Dera Ghazi Khan nuclear site. "An expansion in nuclear weapons production capabilities needlessly complicates efforts to improve the security of Pakistan's nuclear assets," the report concluded.